I was walking by Petco with my boys today and as the automatic doors slid open we spied some Greyhounds that were up for adoption. So we couldn’t resist going in and petting them as well as checking out the other animals they had there. We saw some mice and rats, birds, snakes geckos and turtles. And of course fish. 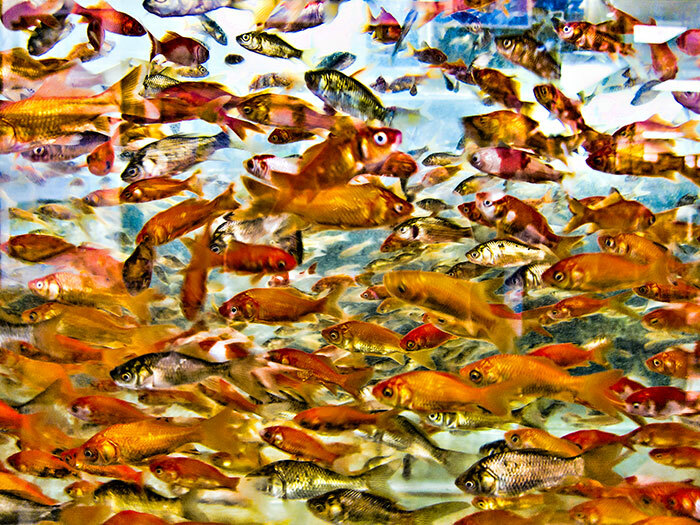 There was this one tank with what seemed like thousands of little gold fish and minnows. It seemed like there were more fish than water in the tank. This photo is what we saw. Even though the photo is a little noisy (thanks to ISO 800 on a Canon S90) I still really like it. The shutter was slow enough to depict the motion of the fish in the tank. What do you think? Do you like it too? I do like it. My first thought was that it would be a good picture to hang in the upstairs bathroom with the fish theme. That would be cute wallpaper on an accent wall. Love it!